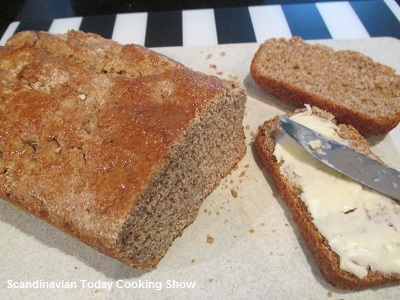 This Whole Wheat Rye Bread is so good that you might just want to have only butter on it. Nothing else! 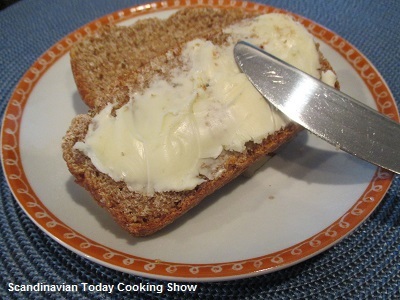 We think using fresh baked rye bread is very delicious for sandwiches such as the open-faced sandwiches. 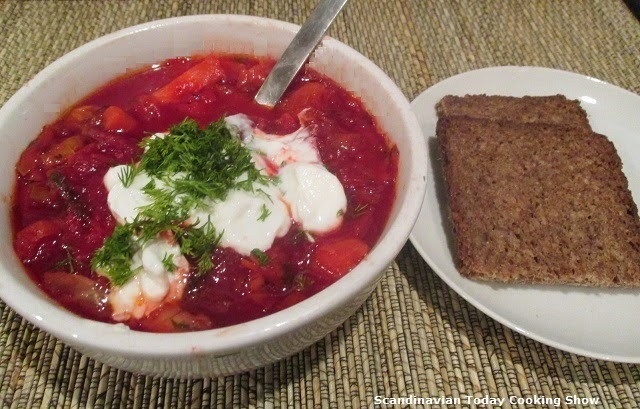 Also you may have noticed that with our soup blog posts such as Cabbage Soup or the Beetroot Soup that we always have a slice of rye bread. So when we can, we try to include a slice of fresh baked rye bread. There are many variations to make rye bread. 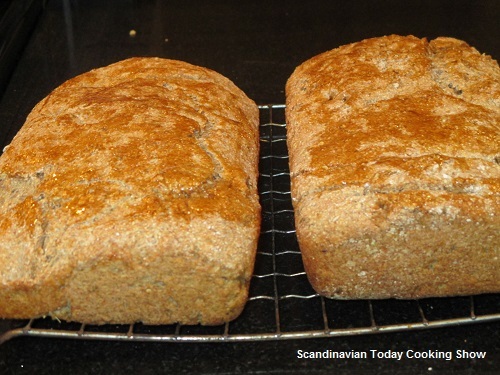 Here is our version which was inspired by Finnish Rye Breads which makes 2 loafs. Enjoy! Dissolve yeast in warm buttermilk in a large bowl. 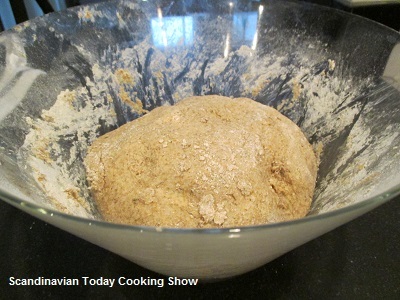 In a large bowl combine milk, salt, syrup, butter, fennel seeds and 1 cup of rye flour. Stir this well with a wooden spoon. Mix in the remaining rye flour. Add the wholewheat flour by stirring until the dough is stiff enough to knead. Or use and electric mixer. Flour the counter surface. Knead the dough for approx. 5 min. Add flour as needed. If the dough sticks to your hands or the board add more flour. Cover dough with a towel in a large bowl Let the dough rise 1 1/2 – 2 hours or until double. Punch down dough and divide to form two round loaves and place them in the two greased baking pans. Cover the pans with a towel again. Let loaves rise until double, about 1 1/2 to 2 hours. Preheat oven to 375 degrees F (190 degrees C). Bake for 30 to 35 minutes or until they sound hollow. Let the breads get cold before slicing or slice the next day. We hope you enjoy our rye bread recipe. Let us know what you think in the comment section if you try this recipe. We have a large selection of open-faced sandwiches and pork recipes. We plan to post the pork tenderloin open-faced sandwich in the future. As well we plan to post a stuffed pork tenderloin too. Be sure to check out our selection of smørrebrød and pork recipes to see the variety of possibilities. 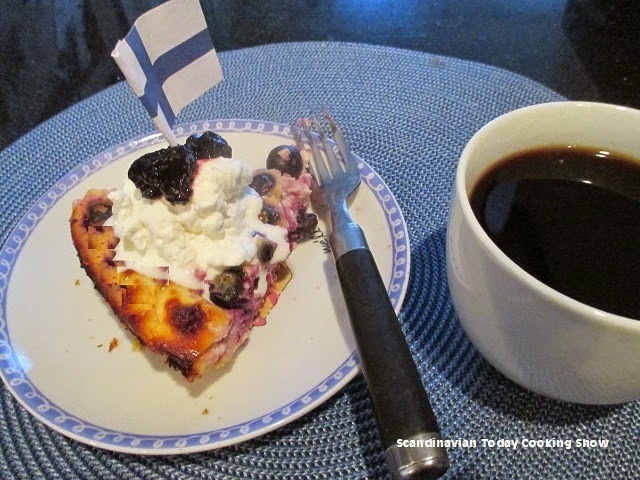 Finnish Blueberry Yogurt Pie – Mustikkapiiras – Super Easy To Make! This is a really easy blueberry pie to make. Plus, it is a refreshing pie to have during the summer season. If you plan to have a barbeque or a summer party, you could make this pie the night before. The pie is great cold but you can serve it warm as well. 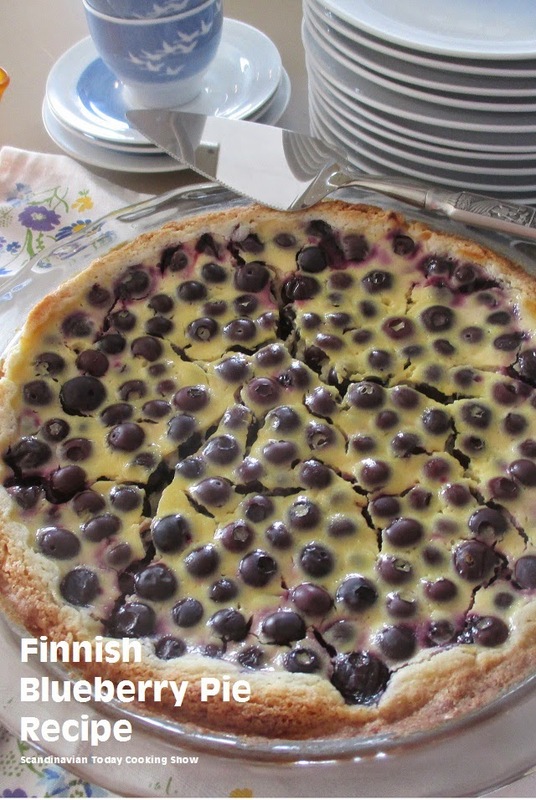 We were interested in making this delicious Finnish blueberry pie because it has a couple of our favorite ingredients which are blueberries and yogurt. 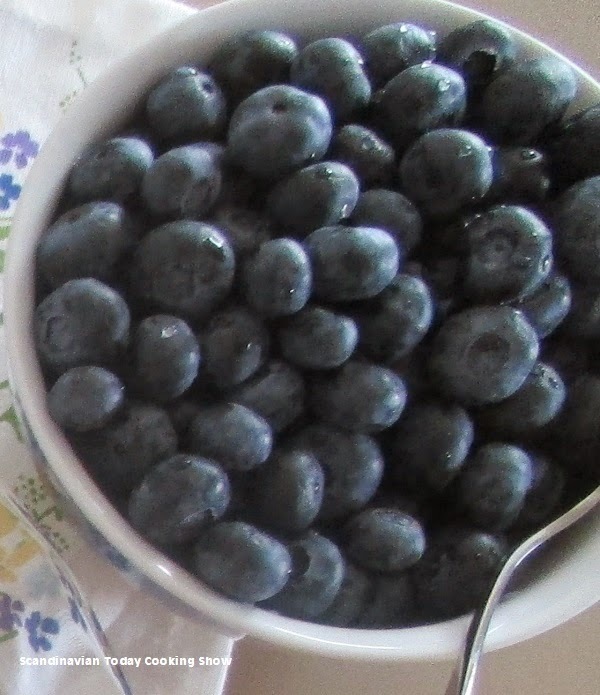 Almost every weekend, my children and I always have yogurt and we add some type of berry such as blueberries. So I had to make this recipe when I saw the ingredients. So let’s get started. First we need to make the pie shell then the filling. Finally we will assemble and bake. Be sure to look at our YouTube video to see how to make the pie too. 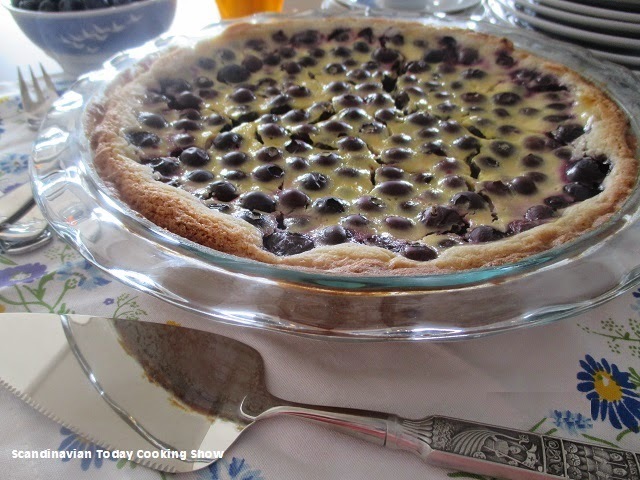 to see how Karen Grete prepares the blueberry pie. 2) Butter and flour a 9 or 10-inch pie pan. 3) Beat 3/4 cup sugar and soften butter until the mixture is smooth and creamy with an electric mixer. Add the egg and blend well. 4) Mix into the wet ingredients the baking powder. You might want to switch from the electric mixer to a wooden spoon or use your hands to mix the dough. Stir in flour, 1/2 cup at a time and to form a soft dough. The dough will be sticky, like sugar cookie dough. 5) Butter pie pan. Dust the pie pan generously with flour. 6) With flour-dusted fingers pat the sticky dough into the bottom of the prepared baking dish. Push the dough up to cover the sides of the pan and create a raised edge of dough around the dish. 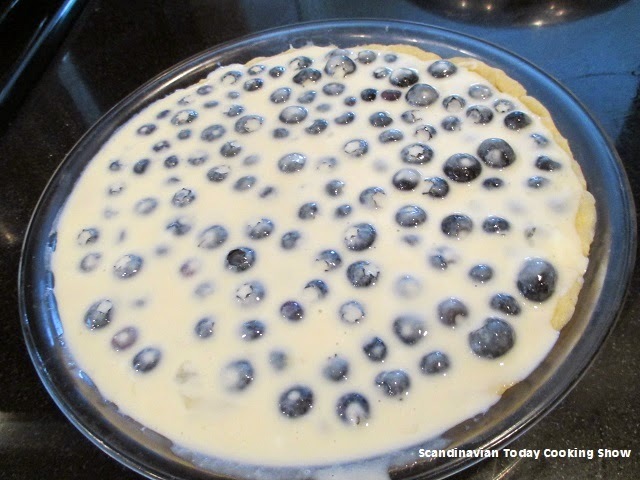 7) Put the pie pan in the refrigerator to cool down while making the blueberry filling. 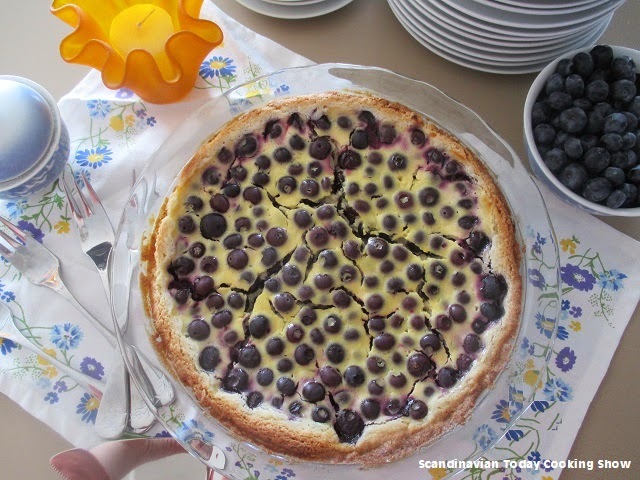 2) Place the 2 cups of blueberries into the cold pie shell. 3) Gently pour in the filling so the berries are coated and evenly distributed. If need be gently tip the baking dish to spread the filling around to fill in the gaps. 4) Bake in the preheated 350 degrees F oven. Bake the pie for 50 to 60 minutes, until the crust is browned and the custard has set. The blueberry pie can be served warm or cold. Also the pie can be served plain or with whipped cream or vanilla ice cream. A nice cup of coffee goes well with this too. The pie will hold well in the refrigerator for a couple of days. 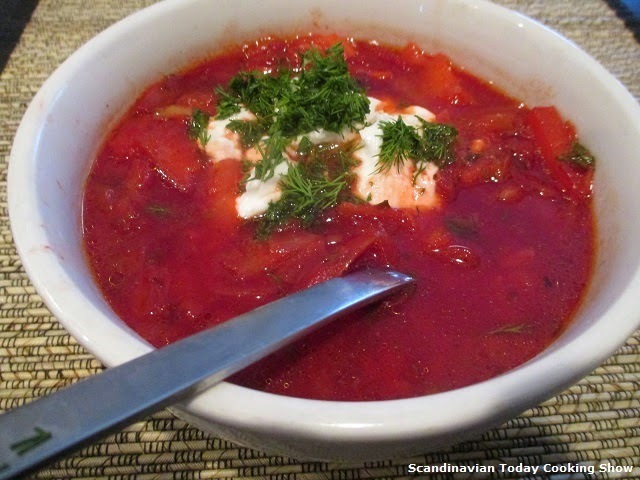 Also the recipe is versatile to add other types of berries such as raspberries or too. Enjoy!